As we enter the age of constant cameras (and microphones), individuals have become broadcasters.Â Almost unseen in the recent news cycle were the riots in Haiti. The government raised gas prices to $20 a gallon to balance the budget. Riots ensued, buildings burned, three people died, and the government suspended the price hike. A friend returning from a humanitarian mission shared these photos, and said she was relieved to have escaped. 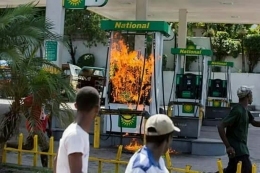 Beside the raw authenticity of these cell phone images, they are interesting becauseÂ The Washington PostÂ reported that “At one point they attempted to set a gas station on fire but were held off by police.” However, one of these photos shows a gas pump burning at a Haitian gas station.